NEW! Now available - RenewMe 120 count capsules (800mg), try it today! Mix in juice, morning and afternoon, or as desired. Maximum benefits occur if taken on an empty stomach. Store in a cool dry place, no refrigeration necessary. For general total body maintenance take 2 of the 400mg capsules. For increased body support take 4 capsules of the 800mg. Our proprietary blend is formulated to minimize whole body pain, provide healthy assistance for bone and joint support, and also increase flexibility. Plus, it has an added boost of Vitamin C, from Camu Camu, to support your immune system. E3RenewME! provides an overall healthy balance to your body, helping sustain a healthy lifestyle*. Suggested Use: For people who have pain in their joints or limited flexibility, use 1 3/4 teaspoon of powder or 4-800mg capsules per day. If you are training and exercising on a regular basis, take an extra 1 teaspoon or 2-800mg capsules at night. Suggested Use: For people who want to boost and maintain their body, take 2-400mg capsules per day. For enhanced benefits, take the recommended use in combination with our other products. We suggest for those who train, use in adjunct with E3Live and Blue Majik. "My joints have popped and cracked for years. After taking E3 RenewMe for about one month, I noticed a big difference –they no longer pop or crack. I feel more flexible. It has also improved my elimination. Thank you E3!" Our proprietary blend is formulated with Methylsulfonylmethane (MSM), Organic Spirulina, Camu Camu, Tocopherol/Tocotrienol, (Vitamin E Complex from soluble rice bran), Organic Cayenne, Organic E3AFA® (Aphanizomenon flos-aquae), BrainON® (Phenylethylamine and Phycocyanin extract from E3AFA®), Crystalloid Electrolyte Sea Minerals (Organic Copper, Iodine, Manganese, Zinc, Potassium, Cobalt, Sodium, Selenium, Chromium, Silica and Boron), vegetable cellulose capsule. 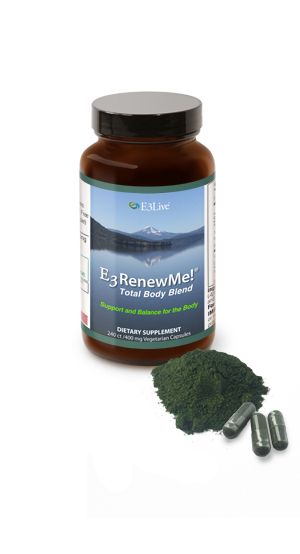 Renew Me is an absolutely fantastic blend that has helped my body function optimally in so many ways! I have noticed substantial improvements in my hair growth, skin clarity, immune system, and energy levels. I consume handfuls of the product daily. Renew Me would be my "stranded on a deserted island" supplement. Huge leap in mental clarity, used to have to jog for thoughts or ideas and now they just pop up instantaneously. I'm retaining more of what I read and learn, the boost in energy is amazing I can do more activities without worrying about fatigue and exhaustion, I sleep better at night and I feel lighter on my feet. Excellent product I've had compliments from every soul I've shared some with they all want to get some. Highly recommend. I have been taking this for a week now. I feel so much better! My head is clearer and I am sleeping better. My mind doesn't wander as much. I have more energy during the day and feel refreshed! 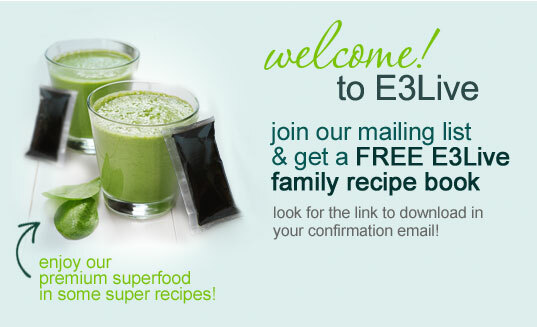 I have been taking E3live products for almost a year and let me tell you something.. it works like anything I have ever tried. I always feel uplifted and good when taking it. My hair and nails grow beautifully. I notice improvements on my skin. So it works! I recommend to try it for yourself. The quality and strength of my hair and nails improved greatly. Ever since I started taking Renew Me, I have yet to get sick. Coming from someone who has a compromised immune system, works in a dirty retail store (customers, animals, money handling)...I am amazed! I tell everyone about e3 and how awesome it really is! I read the reviews for this product thinking I've tried everything else to help my issue with fatigue, why not? My expectations of this product have been met & surpassed! I've only taken the product for a week & my energy has improved 150%. By day four I woke uo feeling a difference in my mood & energy & my appetite for sugar & junk food has completely disappeared! I cannot wait to add E3 Live to my daily regimen.